SEO Website Content. Right Now. The reality for RG Industries end-user customers is no power means no business. It’s that simple. RG Industries provides equipment supply, identification, testing, qualifying and repair services. 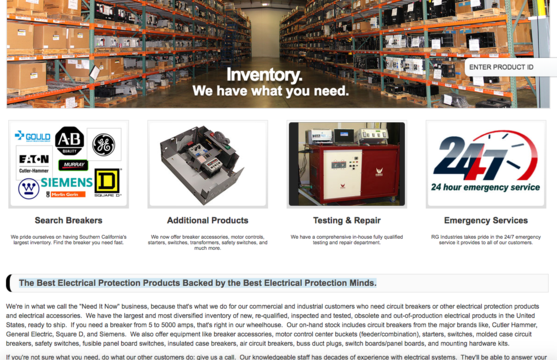 It keeps customers energized with the largest and broadest stock of new, re-qualified, tested and out-of-production electrical protection products in the United States. RG Industries carries the best-known and trusted brands, and has more devices, sizes and capacities in its warehouse, ready to ship, than any competitors. RG Industries’ people have years and sometimes decades of experience in electrical protection and related devices. They’re adept and fast when it comes to helping a customer figure out what he needs and getting it shipped quickly. The company takes pride in its exceptional customer service, high-quality products and being the fastest-to-delivery supplier. In short, RG Industries provides the best electrical protection products back by the best electrical protection minds. RG Industries wanted to make sure its messages of exceptional customer service, deep industry knowledge, high-quality products and being the fastest-to-delivery supplier were reaching as many people in the industry as possible. That meant strong website content optimized for search engines. Weak SEO, fewer new leads. It was that simple. I helped RG Industries refine its message, optimize its website content for SEO and take advantage of the Internet as a source for new customers. Since then, I’ve been helping the company carry its “Right Now” message forward with copywriting for its marketing and sales materials, including a line card and a presentation for prospective customers.